1. You're not worried by the prospect of a magnanakaw hiding under your bed, because you know there is literally NO space left under there. It's full of back-to-back shoe boxes full of old magazines and unused clothes and shoes. 2. You're bad at clearing out your closet "just in case" you ever need something. "No, I haven't worn this plaid shirt in two years, but what if I ever go to a Western-themed party?" 3. You've spent more money on storage boxes than you care to admit. Because organized hoarding is better than unorganized hoarding, right? RIGHT? We'll keep telling ourselves that, anyway. 4. You dread to think of how long the things under your desk have been there. The probably-not-necessary purchase from the post-Christmas sale last year, the uncomfortable-but-cute shoes you were forced to leave in the office, and the only-used-once protein shaker. The mice probably love it. 5. You keep every paper bag or reusable envelope you've ever been sent, usually stored inside the biggest envelope and paper bag of them all. 6. You see absolutely no problem with buying new things—despite the fact you probably have three open ones at home already. "YES THIS IS THE FOURTH BRAND OF CONCEALER ON MY DRESSER—SO WHAT?" 8. Every time you attempt to "clean out" it usually turns into you discovering something in one of your 23 shoeboxes and getting distracted for hours. 9. You're a sucker for freebies—even if you know deep, deep down that you don't need it. You have a drawer dedicated to hotel shower caps, shampoos, soaps, and cotton ear buds. No shame. 10. You still have chargers for electronics you don't even own anymore. Y'know, just in case you decide to get yourself a Nokia again. 11. Your purse is full of expired tickets, gift certificates, and receipts, and you tend to avoid emptying it out of dread. And your collection grows every day. 12. You have a habit of stockpiling things rather than throwing them, because you never know when they might be useful. A festival lanyard from 2014 could be worth a fortune at some point. Maybe. 13. Speaking of festivals and concerts, you have never, ever thrown away a wristband or ticket from ANY event you've been to. You've probably never looked at them since that night, either. 14. You *would* throw away those shoes with the holes, if it weren't for the fact they might come in handy next time you're gardening. Correction: if you ever do any gardening. 15. 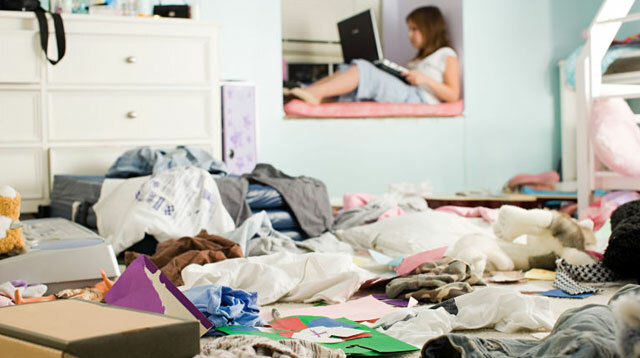 It might look like a load of clutter to the untrained eye, but you do have a ~system~ of sorts. Kind of. Sort of. A bit. Not really. 16. If all other career prospects fails, you'll launch a highly successful online business and make lots of money selling your hoarded things. Except you won't because you can't let them go, but it's worth a try. 17. You make a decision about buying or renting property based on the shelf potential. Built in storage? Adjustable shelving units? GIVE IT TO US ALREADY. 18. Whenever someone mentions that they need something, you tell them you've got one "somewhere." Just where exactly "somewhere" is, you're not entirely sure. 19. You buy things even though you know you already have something similar, usually because you're not actually sure where the other one is.